The learning performance of the students will be improved with the help of tutorials (coaching, scaffolding, articulation, reflection, exploration) and especially through innovative working methods such as the inversed classroom, applied problem-oriented thinking such as during the Pilot Case. Students will directly apply the theoretical knowledge they learn and immediately see the concrete impact. During the two years, innovative teaching methods will be used such as online courses or webinars. 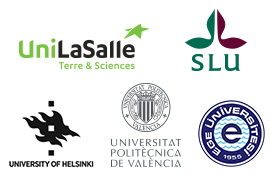 Students will follow the evaluation procedures established at each partner university of their mobility track. Student performance will be assessed in every course. To pass the courses, the student has to pass the exam and other exercises, such as literature and laboratory reports as well as oral presentations, computer based test, written exams, internship report, tutored work reports etc. These components will be graded according to the national grading scale and the ECTS grading scale and contribute to the final grade for the course. The student is evaluated according to the course objectives. The ECTS credits for an individual course are awarded if the student passes the exams according to the local rules of the university. In the event a student fails a course, re‐sit options shall meet the regulations of the hosting University. Any specific regulations from the hosting University shall be respected.